Your compost bin is home sweet home for an incredible variety of bacteria, fungi, insects and worms. Although oxygen-loving bacteria comprise the rank and file workers who perform most of the decomposition in your compost bin, the insects and worms--called physical decomposers, according to the University of Illinois Cooperative Extension--contribute by mixing the waste, as well as biting and tearing it into smaller pieces. Several insect and worm species found in compost bins choose to reproduce there, as well, since it provides such a favorable environment for food and growth. Soldier fly larvae are the most common type of larvae found in compost bins. The soldier fly, a black, compost-loving fly species, chooses moist, nitrogen-rich areas of compost waste to lay their eggs. Appearing in the form of maggots that can be up to 1 inch long, the fly larvae often arouse feelings of disgust and repugnance in the hearts of composters, but they’re typically quite harmless. In fact, the presence of these shiver-inducing larvae in your compost often indicates healthy compost--unless, of course, they’re overrunning your bin. Soldier fly larvae are characterized by their creamy, gray-white segmented bodies, which typically wiggle furiously upon being disturbed, as often happens during regular compost bin maintenance. If you start seeing a lot of them, take extra measures to cover nitrogen-rich sources, such as vegetable and scrap waste, with at least six inches of carbon-rich materials to discourage the adults from laying additional eggs. Like soldier fly larvae, the appearance of beetle larvae in compost bins often startles unsuspecting composters, but it simply means that your compost is decomposing. 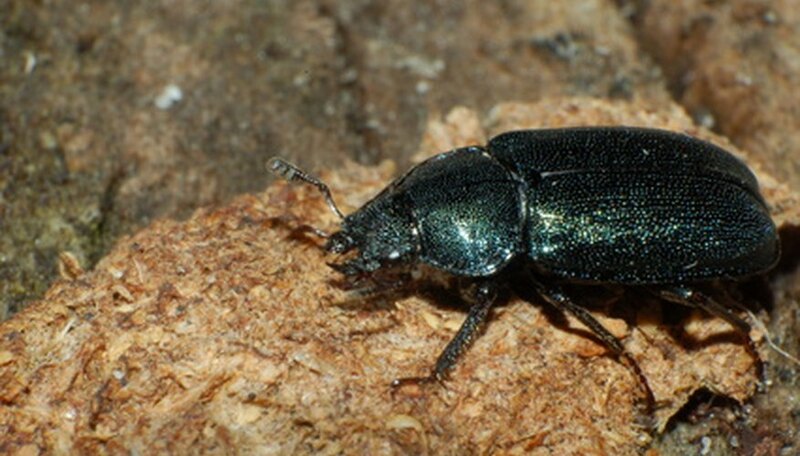 Common beetles in compost include the ground beetle, the feather-winged beetle and the rove beetle. Immature beetles, called grubs, possess long, cylindrical bodies of varying colors and sizes; they typically move rather slowly. Beetle larvae consume an assortment of vegetable and plant waste in your compost bin. Nematodes contribute more physical decomposers to your compost bin than any other worm or insect species. In fact, according to the Cornell University Waste Management Institute, if you pick up a single handful of compost, you’re likely holding several million of these worms in your hand. Unlike the large soldier fly and beetle larvae, you won’t see nematode larvae because they’re microscopic. Nematodes lay up to 70 percent of their eggs in the top 4 inches of your compost, according to Palwinder Grewal, co-author of “Nematodes as Biocontrol Agents.” As the larvae hatch, they burrow deeper into the compost in search of food, which varies, depending upon the nematode species, but includes plant root juice, decaying vegetation and bacteria. Oregon State University Cooperative Extension: Big Maggots in Your Compost?